Chelsea Green Publishing Company, 9781603582544, 204pp. Could there ever be an alternative stock exchange dedicated to slow, small, and local? Could a million American families get their food from CSAs? What if you had to invest 50 percent of your assets within 50 miles of where you live?Such questions-at the heart of slow money-represent the first steps on our path to a new economy. 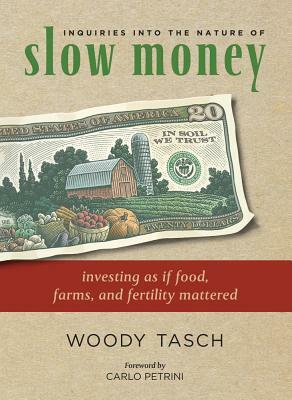 Inquiries into the Nature of Slow Money presents an essential new strategy for investing in local food systems and introduces a group of fiduciary activists who are exploring what should come after industrial finance and industrial agriculture. Theirs is a vision for investing that puts soil fertility into return-on-investment calculations and serves people and place as much at it serves industry sectors and markets. Leading the charge is Woody Tasch-whose decades of work as a venture capitalist, foundation treasurer, and entrepreneur now shed new light on a truer, more beautiful, more prudent kind of fiduciary responsibility. He offers an alternative vision to the dusty old industrial concepts of the nineteenth and twentieth centuries when dollars, and the businesses they financed, lost their connection to place; slow money, on the other hand, is firmly rooted in the new economic, social, and environmental realities of the 21st century. Woody Tasch is president of the newly formed NGO Slow Money and Chairman Emeritus of Investors' Circle, a nonprofit network of angel investors, venture capitalists, foundations, and family offices that, since 1992, has facilitated the flow of $130 million to 200 early-stage companies and venture funds dedicated to sustainability. He lives in northern New Mexico. For information about Slow Money please visit www.slowmoneyalliance.org.